Permit Areas, also known as Sno-Parks. National forests and state parks. Any trail where you hike in summer and fall. Any backcountry drifts where you ski off-trail in winter. Other established trails and controlled areas that ave been mapped. That being said, visiting a resort does have its perks especially for first time snowshoers. For starter, you can rent the snowshoes for a very low fee at the provided rentals. Furthermore, their groomed trail systems are always available. You don’t have to break your own trail, which can be quite challenging for beginners. There are also other beneficial services like guided tours and moonlight treks. 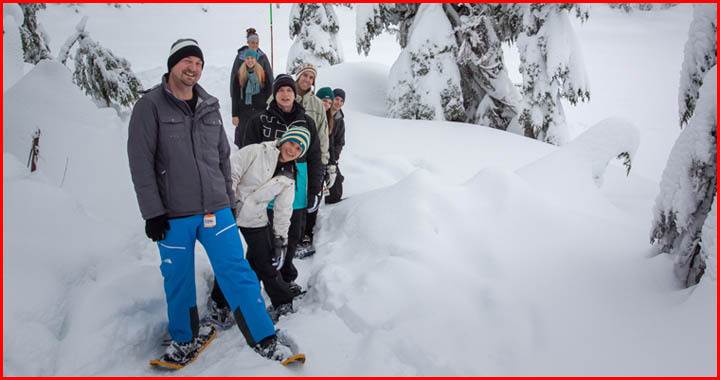 They come at a cost, but you’re guaranteed to have memorable and fun snowshoeing experience while staying safe. Now that you know the difference, let’s list the top places in all North America known to be the best for snowshoeing. Right on the center of North Shore there lies a dazzling winter wonderland called Mt. Seymour. The spot only takes a few minutes of driving from downtown Vancouver. Although it crawls with a bunch of snowboarders and skiers, more and more people come to Mt. Seymour to snowshoe every year. Heaps of snow in the surrounding backcountry accesses can be a heavenly playground for all snowshoers, regardless their experience and expertise. It may never cross in your mind that New Mexico is a go-to place when it comes to winter vacation but the amount of snow fall in the northern areas of the state is quite impressive, actually. Finding adventure-ready snowshoe trails of various lengths in Sandia Mountains is a piece of cake. You don’t even need to walk far from Albuquerque to discover one. Just take the air tram to Sandia Crest. From there you can pick out a trail leading to the mountain base down below. With the sun often looking pretty shiny over Beaver Creek, this area can be a perfect place to snowshoe for anyone. The warmth from the sun can provide a little comfort while you stomp on the deep powder laid out all over McCoy park. For your info, the total distance of trails you can cover there is 32 kilometers. That’s a lot of miles to explore. Best of all, you’ll be accompanied by stunning views over three mountain ranges that surround the area. An when you’re all worn out at the end of the day, you can spend the night at the luxurious Bever Creek Resort. The only thing to note is the groomed trail systems can only be accessed by lift. Located close to the Green Mountain State Forest, visitors of Stowe Mountain Resort has access to over 100 miles of trails. Moreover, the huge amount of snow fall makes pretty much all corners of the area suitable for snowshoeing. Be it on the flat terrain around the village or on the tricky slopes of the mountain, you decide how challenging your snowshoeing can be. Should you haven’t armed yourself with good snowshoes of your own, there are plenty snowshoe rentals around the resort. As for the view, the spectacular panorama of Mt. Mansfield will leave your mouth open. If the thought of snowshoeing with your dog is exciting to you, you might want to consider visiting Camden Hills State Park. It allows visitors to bring their four-legged best friend as long as they keep it on a leash. As for the snowshoe trails, the park has many, each of which offers different level of difficulty. For beginners, try to snowshoe along the wooded trails. If you already pack some experience with you, try tackling the slopes on Mount Megunticook. The most scenic view can be found on Mount Battie. If you feel competitive, try to take part in the snowshoeing race regularly held in the park. Black Hills, South Dakota may not be on your top destination this winter but you can actually have a fun snow playcation too here. Custer State Park, in particular, offers numerous wide-open fields that can be a good place for beginner snowshoers to explore. It’s also a home for buffalo, elk and many other rare animals. For more challenges, you can hit the Centennial Trail that spans from Bear Butte Lake all the way to Wind Cave National Park. Jackson Hole Mountain resort offers a guided snowshoeing tour led by licensed instructors. Now just because there’s a guide involved, do not think that the tour is going to be easy peasy. As a matter of fact, the trails around the scenic Phelps Lake and Laurence S. Rockfeller Preserve can be grouped along with those of medium to high difficulty. Anyway, the tour package includes transportation and snowshoe instruction. If you choose for the full day tour, you’ll also get a free lunch. Of all Michigan’s Upper Peninsula, Porcupine Mountains Wilderness State Park is the best place for snowshoe enthusiasts. Aside from the bountiful snow fall, the park has over 100 miles of trails to explore, passing through the local landmark Lake Superior. Along the way, you can find a number of cabins and yurts where you can take a rest and warm up. Just be sure to condition yourself before hand and plan your route wisely because the weather there can be very cold in all of a sudden. Operating under the management of the Vail Resorts Company, Northstar California offers many amenities for winter sports enthusiasts, including 35k of trails. They’re scattered in and around the mountain. They’re perfect for snowshoeing with family. Just keep in mind that cross-country skiers also use these trails and the common snowshoeing etiquette has it that they have more rights for the trails. So, if you run into one of them, quickly move aside. You don’t have to wait until winter to visit the Apostle Islands National Lakeshore because the natural beauty there is available all year round. Still, many believe that its beauty becomes the most alive in winter when the landscape is completely covered in snow. Snowshoers can explore the trail that begins in Meyers Beach. Once you get to the Lakeshore Trail, be sure to stop for a few seconds to enjoy the scenic views of the local bluffs and caves looking ever stunning with massive dangling icicles.